Energy sector activity maintained its strong momentum in third quarter 2018, according to oil and gas executives responding to the Dallas Fed Energy Survey. 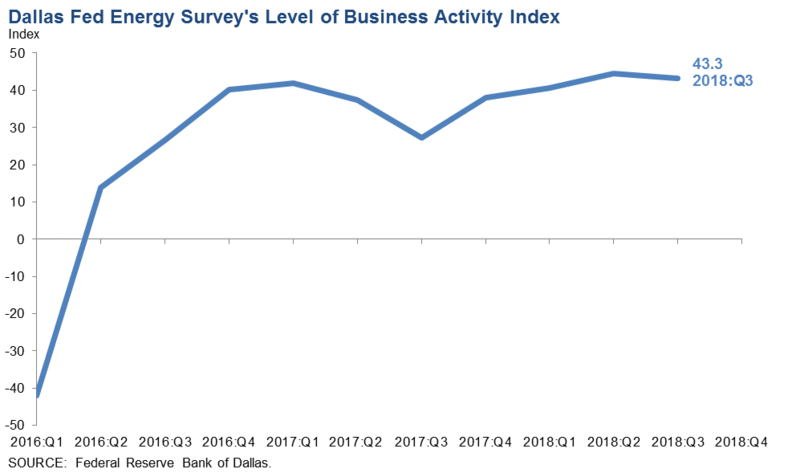 The business activity index—the survey’s broadest measure of conditions facing Eleventh District energy firms—dipped very slightly from 44.5 in the second quarter to 43.3 in the third but remained near the highest level since the survey began. The business activity index for oilfield services firms fell from 54.2 to 45.9, suggesting a slight deceleration in growth for those firms. Meanwhile, the business activity index for exploration and production (E&P) firms rose from 37.2 to 41.8. Positive readings in the survey generally indicate expansion, while readings below zero generally indicate contraction. All indexes in the latest survey reflected expansion on a quarterly basis. Oil and gas production increased for the eighth quarter in a row, according to executives at E&P firms. The oil production index moved down from 39.0 in the second quarter to 34.8 in the third. This suggests crude production rose at a slightly slower pace relative to last quarter. Meanwhile, the natural gas production index edged up from 33.4 to 35.5, its highest level since the survey began. This suggests gas production rose at a slightly faster pace relative to last quarter. Utilization of equipment by oilfield services firms slightly increased in the third quarter, with the corresponding index at 44.8, up three points from the second quarter. Input costs on the services side continued rising as the index jumped from 36.3 to 46.6. The index of prices received for oilfield services remained unchanged at 23.2, suggesting prices rose at the same pace as last quarter. Labor market indexes pointed to continued growth in employment and work hours in the third quarter. The rate of growth slowed though, particularly for oilfield services. The employment index for services fell sharply from 44.1 to 31.7. The hours worked index for services also fell from 50.8 to 41.0. Meanwhile, the employment index for E&P firms increased from 11.6 to 17.4, the highest level since the survey began. The aggregate wages and benefits index remained positive but fell from 27.9 to 23.5. The company outlook index posted a 10th consecutive positive reading and edged up one point to 46.4 in the third quarter. The uncertainty index rose 10 points to 8.8, suggesting that uncertainty regarding firms’ outlooks increased this quarter. This increase was particularly prominent among oilfield services firms, where the outlook uncertainty index jumped nearly 22 points to 14.7. 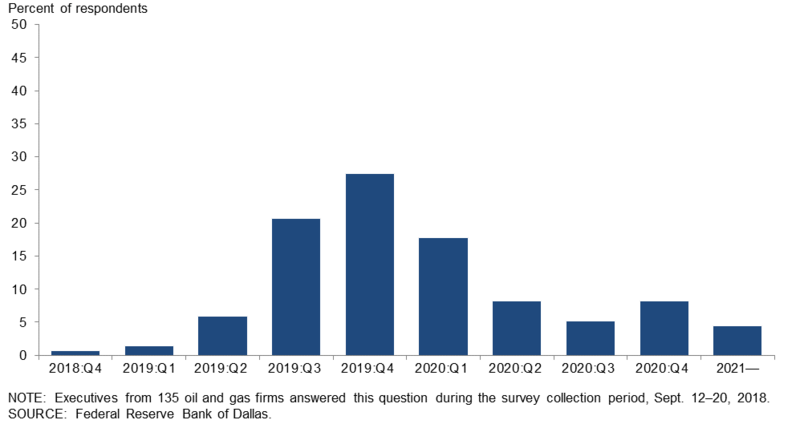 The survey this quarter received a larger-than-average quantity of comments from respondents, particularly regarding pipeline constraints and price differentials in the Permian Basin. 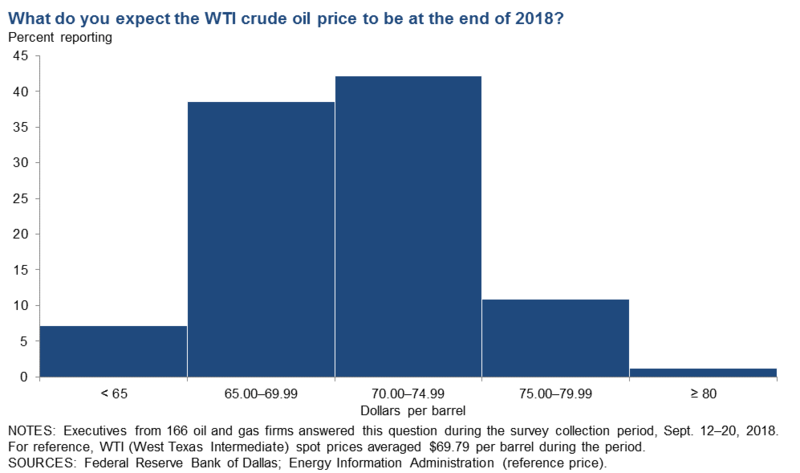 On average, respondents expect West Texas Intermediate (WTI) oil prices to be $68.81 per barrel by year-end 2018, with responses ranging from $55 to $85 per barrel. 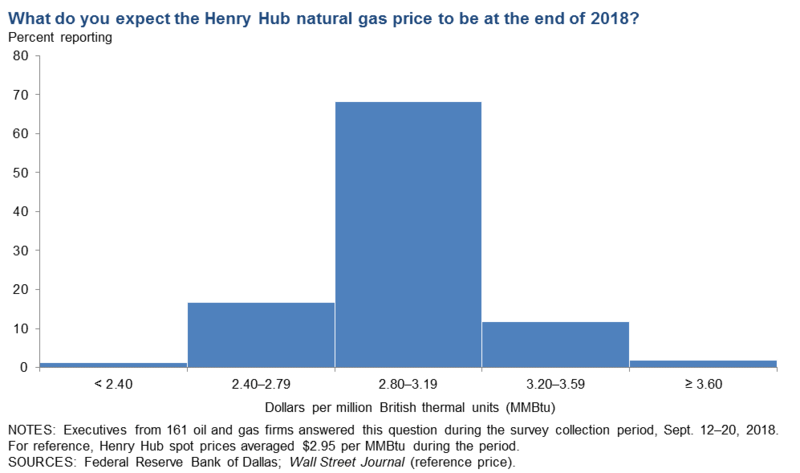 Respondents expect Henry Hub natural gas prices to end 2018 at $2.94 per million British thermal units (MMBtu). The year-end 2018 price expectations for WTI oil and Henry Hub natural gas were close to the spot price during the survey collection period. For reference, WTI spot prices averaged $69.79 per barrel, and Henry Hub spot prices averaged $2.95 per MMBtu during the survey collection period. Data were collected September 12–20, and 171 energy firms responded to the survey. Of the respondents, 110 were exploration and production firms and 61 were oilfield services firms. 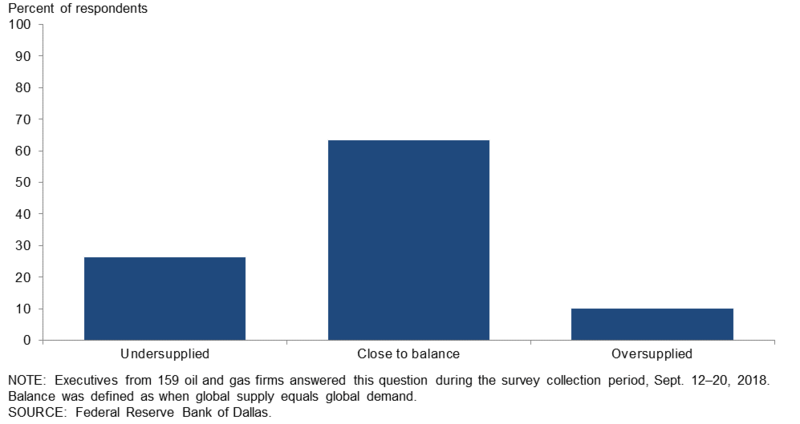 Data were collected September 12–20, and 168 oil and gas firms responded to the special questions survey. 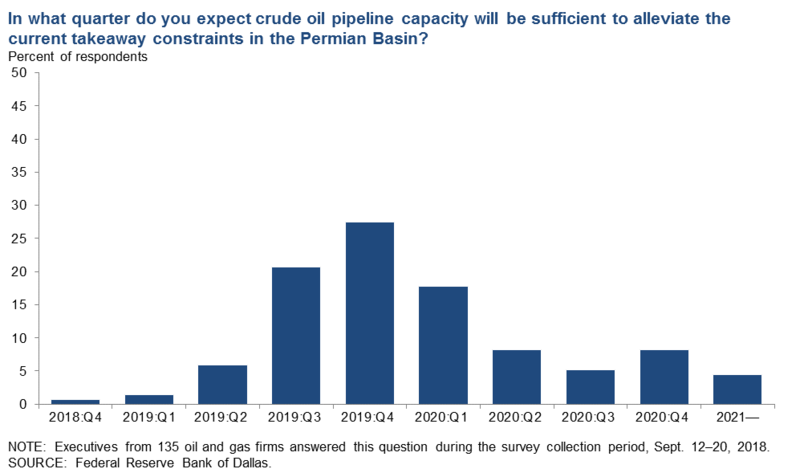 In what quarter do you expect crude oil pipeline capacity will be sufficient to alleviate the current takeaway constraints in the Permian Basin? Over half of oil and gas executives responding—56 percent—said they expect crude oil pipeline capacity will be sufficient to alleviate the current takeaway constraints by the end of 2019, with the remaining 44 percent saying it would be 2020 or later. The most frequent response—selected by 27 percent of executives—was fourth quarter 2019. 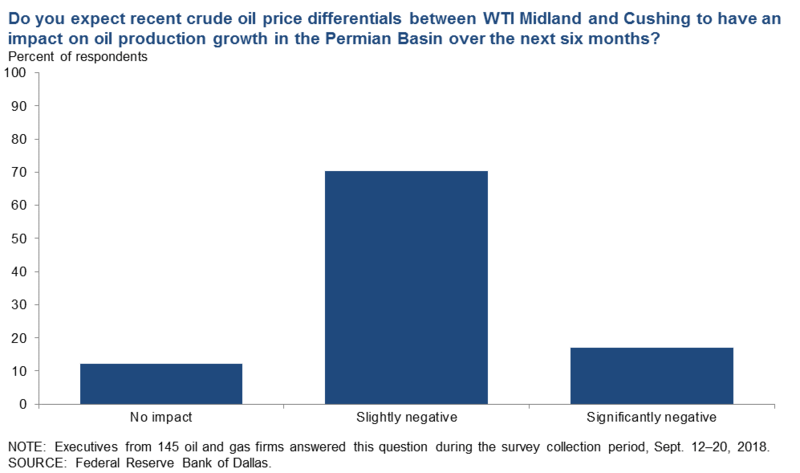 Do you expect recent crude oil price differentials between WTI Midland and Cushing to have an impact on oil production growth in the Permian Basin over the next six months? The majority of the executives—70 percent—said that they expect recent crude oil price differentials between WTI Midland and Cushing to have a slightly negative impact on oil production growth in the Permian Basin over the next six months. 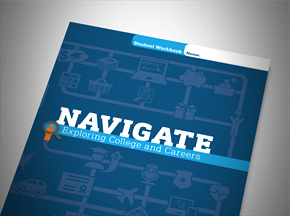 Seventeen percent expect significant impacts, while 12 percent expect no impact. What impact has steel import tariffs (25 percent) had on your business so far? A little over half the executives—52 percent—said the steel import tariffs (25 percent) have had a slightly negative impact on their business so far. 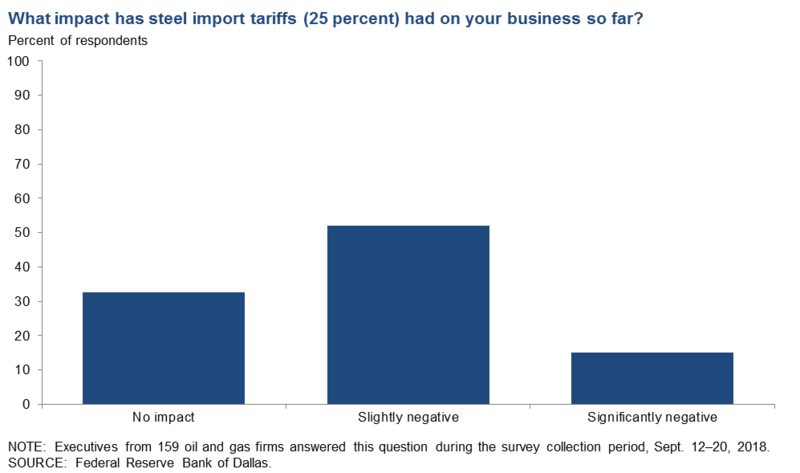 Thirty-three percent noted no impact, while the remaining 15 percent said the steel import tariffs have had a significantly negative impact on their business. The global oil market moved into balance in the first half of 2018. 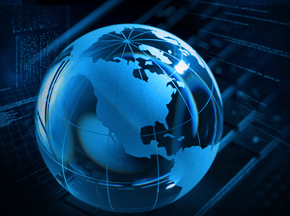 In 2019, do you think the global market will be undersupplied, oversupplied or close to balance? 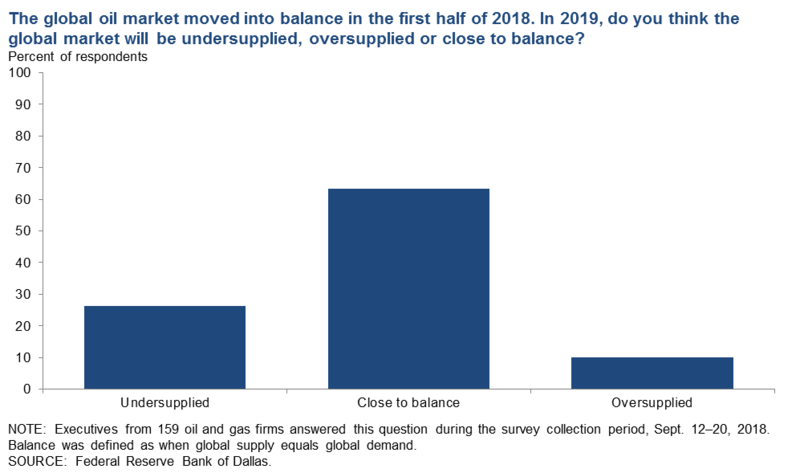 The majority of oil and gas executives responding—64 percent—said they think the global oil market will be close to balance in 2019. Roughly a quarter of all respondents (26 percent) think the market will be undersupplied, while the remaining 10 percent think it will be oversupplied. The steel tariffs have added approximately $100,000 of costs to each of our wells. Some thought should be given to removing the tariffs when domestic mills are not currently running the products. Significant supply chain savings to the Permian could also be realized if there was an interstate or main lane connector between Interstate 10 and Midland–Odessa. This connector would dramatically remove road congestion and accidents from the farm-to-market road system and improve supply chain productivity. Increased uncertainty in geopolitics, oil supply, the steel tariff and the transportation bottleneck keep us on the edge of our seats on a daily basis. Skilled labor shortages (CDLs, mechanics, electricians, welders, etc.) will limit service delivery, timing and quality, and thus negatively impact production growth. Profitability and cash flows will drive the growth in investments more and more over time, with less emphasis on the oil price. The skinny economics in the Permian impacts publicly traded and private producers. The private equity groups are rearranging their deck chairs as they shuffle assets from one owner to another—just like the savings and loans in the ‘80s. They desperately need a price spike to open the exits. I am not an operator in the Permian. Investment in the Permian seems overblown with outrageous costs and little real actual returns for the huge volumes of money being "churned." I believe the Permian operators/industry is hurting itself by flaring and venting natural gas rather than containing that product or using it. This will negatively impact the entire domestic industry, not just the Permian producers. I believe Texas regulators are being irresponsible in allowing this rampant pollution and waste of natural resources. Permian gas takeaway is also an issue, with Waha trading at half of Henry Hub recently. The infrastructure to place output in central Mexico demand centers has been delayed, with project schedules more opaque south of the border. Hopefully, in the next six months, this is resolved. Once again, the perceived geopolitical/military/terrorist exposures will probably define the price of crude oil in 2019. It is difficult to imagine an extended period of time without major disruptions in the market from one or more of those exposures during 2019. Any major disruption in the Middle East could significantly exaggerate the price of crude. The capacity of any of the major producers to significantly increase daily production from current levels is limited, at best, and that is a formula for an exaggerated price of crude if a disruption does occur. The present administration’s efforts to boost the American economy have ripple effects worldwide. Our economy has the largest demand for energy compared to any other country in the world. This, along with the general worldwide growth, is pushing up demand for energy in general. Iran is the question as to what price will be for oil. America is becoming a major exporter. Demand for liquefied natural gas is also a key driver for natural gas prices. Storage volume today, the upcoming winter and Gulf hurricanes may cause price spikes for natural gas. Oil prices’ current stability is the result of a managed market and not truly representative of an optimal supply-and-demand market. Ultimately, demand will become the driver on price, and the current excess capacity being held off market can come back in. However, it is always the unknowns in the oil market that confound prognostication. If the Iran sanctions remove more than 1 million barrels per day and Venezuela continues in decline, we could see $90 per barrel for Brent oil. Shale producers in the U.S. will not be able to ramp up production as fast in 2019 as we have over the past two years. We have seen the benefit of most of the low-hanging fruit (core acreage has been drilled, lateral lengths cannot get significantly longer, high-density pad drilling has added most of the potential gain, etc.). Calls for increased production could only be answered by Saudi Arabia and Russia, and I doubt they have the excess capacity to satisfy demand growth. International budgets for drilling should finally start growing again in 2019, but those are longer-term projects that will not deliver increased oil production for three to five years. There are too many factors affecting the price of oil to justify a guess as to oil's future. With our service primarily on the Gulf Coast, where activity has been near a standstill as far as new production coming on line, we are not privileged to increase volumes from the Permian Basin. We have a very positive overall outlook for the industry. The infrastructure is growing, and drilling and completion costs are staying relatively flat. Our operations are in good shape. Our major uncertainty is oil and natural gas prices over the next 18 months; prices could be significantly up or down. We just don't know where prices will go, and "expert" opinion is all over the map. Our main "uncertainty" is the takeaway capacity of crude oil from our Permian Basin properties. We have a single-rig operation in the Eagle Ford. Our planning to date does not show large cost inflation or delays. Costs of tariffs on steel seem to be able to flow down to producing companies’ costs of doing business. Pipeline and trucking constraints in the Permian Basin are hurting us now. There was a $13 per barrel price deduction for August, and I hear it may go to $20 per barrel. This, over a long period of time, is going to impact my drilling program. Crude oil pricing will be impacted due to the Midland–Cushing differential. Infrastructure build-out to increase transportation capacity will probably take longer than anticipated, resulting in price suppression for much of 2019. Our financing has solidified. Our drilling costs are flat, and completion costs for sand and pressure pumping (fracking) have decreased 30 percent from their peak in 2014. Conventional activity continues to be greatly overshadowed by the unconventional plays. This is leading to reduced access to service and equipment for conventional companies. I would expect this trend to continue and lead to difficulties for smaller, independent companies. Conventional oil price differentials (relative to West Texas Intermediate Cushing) are widening in West Texas and Central Oklahoma. Gas price differentials (relative to NYMEX Henry Hub) are widening tremendously in West Texas and Central Oklahoma also. Gas purchasers in Oklahoma are charging a variety of fees in 2018 for the privilege of taking a producer's gas production and are advising producers it will get worse after Jan. 1, 2019. Bias toward higher interest rates and troubled economies in Turkey, South America, etc., could result in oil demand destruction and lower, or flat, oil prices. On the natural gas side, U.S. storage numbers are so low that I think we will see a bump in prices to a $3 handle this winter. Optimism will get flushed if we return to a Democrat-led Congress in November. More regulation and anti-fossil-fuel campaigns will reduce enthusiasm for risk-taking. If the East Coast and West Coast rule the political landscape, then independent producers will need to seek greener pastures. Increased uncertainty in oil, steel and logistics pricing is impacting business decisions. We are preparing for major development in 2019, which has been delayed by partner issues for several years, so activity at our firm will increase. The most significant risk facing our business is widening natural gas basis differentials. The cost of supplies is increasing. We generally have a positive outlook but are concerned about future volatility in oil markets as a result of Saudi and Russian manipulation of volumes and increased U.S. oil production. State of Louisiana Department of Natural Resources bonding regulations and inactive well fees remain quite burdensome. Legacy lawsuits are still lurking. We are seeing continued high costs, which are squeezing profit margins significantly. I will cut activity in 2019 if this continues unabated. The current administration has cut regulation, which has definitely helped the overall economic outlook over the past two years, albeit the oil and gas economy has moved up but slowly. Significant fluctuations in crude oil pricing and uncertainty about the future taint some of our planning for the future. Pipeline takeaway is the major issue for the next nine to 15 months. We saw two factors capping growth in the second quarter. The Permian pipeline capacity and discount on WTI [Midland] have slowed completions. We expect to see fewer wells completed in the second half of 2018. Many E&P [exploration and production] companies will spend their budgets for 2018 before the end of third quarter 2018. This higher spending rate was a result of higher efficiency and higher service company prices. The net result will be a decline in total completions in the second half of 2018. We think a rebound will happen in first quarter 2019, but the Permian will continue slow growth until the pipeline capacity is increased and the WTI [Midland] discount is eliminated. Takeaway concerns in the Permian have created an overhang. However, none of our customers have indicated that they intend to reduce drilling activity. We are hopeful that the pipeline constraints will be resolved in 2019. Although WTI prices are staying in the high $60's per barrel, in the Abilene area we are being paid in the low $50's per barrel. Completions continue to lag drilling activity. There is increasing uncertainty in crude prices and increasing worry about a global economic slowdown. Recovery is getting long in the tooth. We are having difficulty hiring and retaining commercially licensed drivers. We are also experiencing difficulty hiring qualified roustabout hands and getting personnel to relocate to the Permian Basin. We are still lacking enough qualified drivers who are able to pass motor vehicle record checks and Department of Transportation preemployment drug tests. Additionally, the market is so competitive for drivers that they will jump ship for an extra 50 cents per hour. Customers remain very cautious but it does appear that the bottlenecks in the Permian are causing investment dollars to move elsewhere. We are clearly more optimistic than a year ago, but we will maintain our investment discipline as we expect our customers to remain cautious. We switched our primary area back to East Texas from the Permian. We have noticed fewer clients, but my work is stable for now. I am turning down West Texas work currently. The exuberance and constraints of the Permian Basin are allowing other oilfields to enjoy balanced activity levels that yield solid utilization and profit numbers.